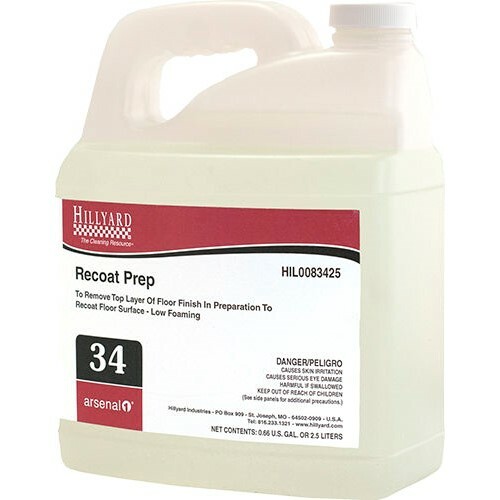 Home → Chemicals → Hillyard, Arsenal One, Recoat Prep #34, Dilution Control, HIL0083425, Four 2.5 liter bottles per case, sold as One 2.5 liter bottle. For interim maintenance of floor polish in between stripping cycles. Removes top layers of finish to prep floor for recoating. Formulated to remove layers of finish that contain embedded dirt and yet leave a base coat of finish intact. Formulated to remove only top layers of floor finish. Extends time between stripping cycles. Concentrated for economical use.